I love the expression, and the look of it. It is rare to see a girl in a warhammer universe, and a cute one is almost impossible, so I find this one really great! She's a great girl. 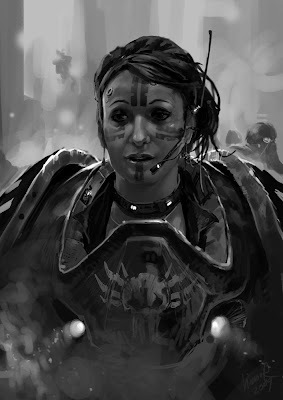 She deserves to be a space marine! Nerd rage: Females cannot be SPEHSS MEHREENS. It's BROS ONLY! Nevertheless, fantastic work here. Brilliant as usual!